Come join us at Hippo Roofing! We are currently hiring experienced metal roofers looking for a career opportunity with an employer that cares. We are highly respected metal roofing company specializing in simple to install metal roofs purchased by residential clients. No waiting on dry-ins, materials or shortages. We will provide steady full-time employment year round in a system that will allow you to maximize earnings. Crews preferred; experience shingle roofing trainees considered. Seeking experienced videographer with drone experience for part-time work in Brevard County. The individual must be properly licensed and produce professional results. Professionally video residential metal and shingle roofing project with occasional tasks on special company projects. 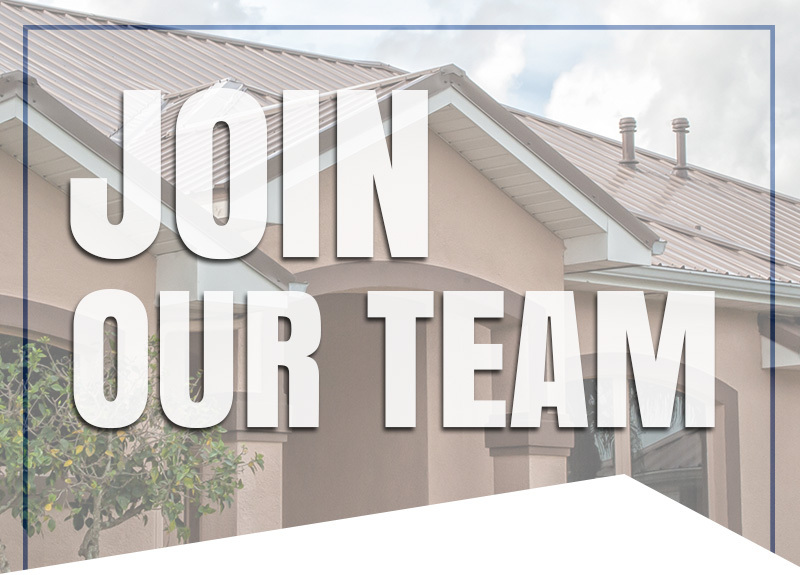 Seeking Brand Ambassador to favorably promote our company during the residential roofing process. Job includes introducing crews, checking on jobs, interacting with clients, sales upgrades, delivering completion packages, collections and obtaining favorable reviews upon job completion. Individual must be a team player, likable, have roofing or general construction experience and have a good personal appearance. Bi-lingual preferred. Must have own transportation. Base salary with commission. Vehicle compensation. Drug-free company. Work location – all of Brevard. Join a growing company of excellence with lots of creer growth opportunity! Leading Brevard County metal roofing contractor seeking additional crews or individuals who would like to join a crew for easy installations. Steady work with strong production support that will keep crews as busy as desired. Excellent compensation by the square. Friendly, safe drug free working environment. Spanish and English spoken. By Sq and Highly Competitive. Signing Bonus. Seeking experienced roofing repair technician. Mostly metal re-roofs with some shingle and flat exposure. Constant long term employment with great growth opportunity. Drug free company and a great place to work. Seeking Roof Consultant to work with leading local residential re-roofer – metal and shingles. A+ BBB rating. Commission based job near the ocean with wonderful weather year round. Average sale $23,000 with a commission of over $1600 per sale with no delay in commission flow. Qualified appointments assigned daily to sharp Roof Consultants that want to be with an aggressive growth company selling a high-quality product at premium pricing. No storm chasing…we are local…and we have dynamic growth year after year with exclusive products and systems. Excellent training provided. Professional appearance with outstanding communication skills required. Monthly commissions for successful Roof Consultants run $5,000 to $20,000. Drug-Free, family oriented professional work environment. www.HippoRoof.com. Train to get better at sales and present residential roofing products – close sales. Very limited production, door knocking, cold calling, insurance or collection responsibilities. Well spoken and educated lady or gentlemen able to climb when necessary and capable of making an excellent impression quickly. Construction experience helpful, but not necessary. Excellent attitude and strong desire to be successful. Technologically component. Melbourne roofing contractor seeking experienced individual desiring full-time work driving Ford F350 stick shift truck with 7 x 14 dump trailer filled with roofing debris. Should be experienced truck/trailer driver comfortable with visiting local landfills. An excellent driving record required. Minor clean-up of trash at a job site or construction yard. Miscellaneous material shortage delivery. No suspensions, major infractions or multiple minor violations. Must be able to pass a criminal background check and drug test. Must be able to meet and greet clients at job sites when delivering trailers and make a good impression. Please submit a brief resume for consideration. Thanks! Melbourne roofing contractor seeking an experienced individual with painting, drywall and/or stucco experience to supplement our roofing activities. Seeking bilingual individual to regularly communicate with our clients from the point of sale to the commencement of installation on a set schedule. Must have excellent communication skills and a lot of common sense. In addition, this individual will provide routine support to the production department. Well spoken and educated lady or gentlemen capable of making an excellent impression quickly. Construction experience helpful, but not absolutely necessary. Excellent attitude and strong desire to be successful. Technologically component. Looking for a very energetic ladies or gentlemen to attract positive attention holding an advertising sign. Dance to the upbeat music on your iPod while you advertise, tip your hat or otherwise draw favorable attention to yourself and your advertising message. Dependable, youthful, high energy person in good health needed to work high traffic shifts. If you are a person with lots of energy, a great personality, and a big smile, please contact us ASAP. Drug-free environment. No smoking while working. Neat appearance. Must have transportation to and from work site near your home in Brevard County. Steady work pushing 40 hours weekly. A resume is a little much, but please, tell us why you are our candidate and how to get in touch.